Inside the fortress, Al’Akir the Windlord holds court, ruling over his elemental kin. He enjoys watching over the rest of the plane, traveling in the guise of a thundercloud. We'll probably be going up against Al'Akir and his lieutenants in this dungeon. Strangely, this dungeon is marked with the lowest level of entry, yet we need to discover the entrance to queue up for it in the Dungeon Finder. I'd love to see Al'Akir dropping his cloud to be used as a mount. Players floating aorund on a cloud,would be awesome! The screenshots make it look like the Astral Sea from D&D 4.0. Looks a bit like Sanctum, the Elyos capital in Aion. So.. High Priestess Azil is in this and The Stonecore? It looks absolutely breathtaking. Skywall is a very beautiful area! i think that skywall should be the new sanctuary, like shat and dal. wouldnt mind having this as a teleport spot for mages, and a new hang out place for alliance and horde. This instance seems more Greek, something of a mythological Mt. Olympus theme. He summons cyclones which move around him in a circle. They spark anyone near them for lots of damage. So you run to the centre. At some point he'll emote draw the cyclones in. I imagine you're meant to get out of the middle at this point on live, but at the moment it's better to stay in the middle - for some reason it's less damage. Healing here is *difficult*. Summons the forces of WIND! That is, he summons a gale from some direction which changes sides every time he emotes. If you're on the side of him where the gale is coming from ("upwind") you get a +damage debuff, if you're the other side ("downwind") you get a -damage debuff. There's a small trade off though - he does a conal aoe on the side that is currently upwind. It's easily healed. Nothing to it. Medium tank damage. Occasional chain lightning that isn't anything major even if everyone gets hit by it. However, he'll turn away and spend ages creating a pyramid (like you've seen before!). If you don't stand in the pyramid you'll take massive damage which is highly unhealable on more than one target - and pretty serious on just one. Nice mechanics all round though right now they feel under tuned. Stay at the boss to avoid lightning from his thunderstorm clouds. When he pulls the vortexes into himself, spread out around in a circle -evenly, at least as well as you can. Not too far as healer has to reach all. Once they go back out, run inside once more and repeat. Stay relatively close to the boss but in a circle if possible. He breathes at a random target and hits people in cone, not too hard to heal. There is a constant wind on the platform, you should position yourself so that the wind hits your back. This gives you while if you fail at it you get . Spread with a 10 yard range between each player. He randomly casts Chain Lightning on a random target, it will jump but not fatal as long you spread. Usually right after a Chain Lightning he will do Static, a spell that can be avoided if you jump in half cast, otherwise you get rooted to the ground. When he constructs a force-field you will see orbs on the ground starting to appear and forming a pyramid. Boss will only channel and not deal any damage, use this time to run at the pyramid structure and stay in the middle of it. NB: If you fail you will most likely die. Edit: Uploaded a video on Youtube showing the bosses, as this is beta and normal mode I am sure the fights will be slightly different in some aspects. Except that the Elementals were created by the Old Gods who are the enemies of the Titans. The.Most.EPIC.Instance.In.WoW. O.O thats all i can say. This instance is high in the air in the southeast part of the zone, over the ocean. When you jump off the edge of the zone, perhaps hoping you'll be ported to some location over the ocean in Uldum, or just feeling suicidal, you'll be picked up by a blue-and-white whirlwind effect, then thrown (seriously, thrown) back onto the centre of the closest platform. Sometimes the throw doesn't work! And you'll get stuck in a loop. Have fun with that. I've submitted a screenshot of the effect. Somehow, everyone missed the fact that Vortex Pinnacle is a sub-zone of Blade's Edge Mountain. Why? So it won't be the easiest instance in the game after they nerf it for people who lack the ability to move up and down? Why would you even think that it would be? From Miyari's screenshot with the two dragons, it looks like the Infinite Dragonflight is back. Can anyone confirm this? This is a terrible instance, it is just way too easy, i went in there with no knowledge what so ever and killed everything without wiping. terrible terrible instance. With a high level of archaeology, a player can activate a zone wide buff just before the first boss using a Tol'vir Hieroglyphic to grant +1% HP and Mana every 3 seconds for the duration of that lockout. What iLvl does it require to enter this instance? For those who don't know what I'm talking about, in Spyro: Year of the Dragon (old PS1 game), there was a level which resembled very much this instance. I came here to post this lol. I thought I was the only one! I agree with you too, same thing I thought of. I'm surprised fanboys haven't chimed in on mentioning the similarities to Cloud City this instance looks like lots of fun. Found this dungeon entrance and wasn't able to queue for it at 80, it's a different level. For those of us that don't already know where the entrance is. The Tempest Lurkers are Boos, from Mario Bros.
Just did this one as my very first cata instance, but now I am the only one left in the group and need to hand in the quests from this instance. How do I get back to the entrance? Is it Bug? or Its like Blue proto from Utgard? How do you get out of the instance? I get Epic mount from normal at 1st day cataclysm. Any other Paladins having their Aura's removed on the early fights? Working as intended or something broken? My first impression on finding it....OMG its the Palace of the Childlike Empress from the Neverending Story. 2nd impression, if thats the case, I WANT A RACING SNAIL MOUNT! It appears that if you collect the Golden Orbs it may reduce the magic damage from the sparks. Anyone else notice or try this in heroic? You're going to wipe on these guys your first time, probably the first few times. They have a wide aggro radius and quickly launch a devastating ranged barrage on your group. Everyone has to rush them at the exact same time! Pick a kill order and mark them. Pre-shield everyone if you can. Rush in as a group, blow your defensive cooldowns, and focus them down quickly. If you have good ranged classes in the group, everyone should stack in the middle where the healer can spam AoE heals or Power Word: Barrier. If you have more melee, then move as a pack to each target and focus it down quickly before moving on to the next. Found in the packs of Tol'vir, these are the healers, usually two per pack. You can deal with the Adepts in a variety of ways depending on their placement and your preference. Their placement in the pack seems to vary, so you may not be able to use the same approach every time. You should either CC both Adepts while you kill the rest of the pack, or CC one of the Adepts and focus the other one down first, then kill the rest of the pack. If you fail to CC them, they will spam Greater Heal (heroic Greater Heal) every few seconds, making it almost impossible to take down the rest of the pack. In a pinch, you can interrupt/silence/stun them to buy some time, but this probably won't be enough to save you if both are up. If you have a mage in the group, you probably want to Spellsteal their Desperate Speed buff. More trouble than it's worth to kill (due to constant health regen), but watch out when you walk away! Will use Feign Death when anyone in your group is facing it. When you turn away, they will pop back up and cast 6K-8K Lightning Bolt (heroic: 14K-19K Lightning Bolt). Don't bother trying to kill these. They have an absurd amount of health. Just hit them a few times as you move past to disable their knockback. Not especially dangerous, but you'll want to pull it out of the healing circle in order to kill it. Drake in dalaran if you arent belive me. wowhead, cant you do a little better in the description than "located in the skies of uldum" ? wtf? When my party left after 1 wipe in hc. I wonder what are these for? Any1 know that? The golden orbs are to the left on the circling thingys that pushes you back if you don't hit. after you defeat the dungeon....how do you get out? (mage ports or hearth's don't count). You can't run out, because of the air portals. You can't jump off the edge. Upon most recent patch blizz made it so jumping off the edge ports you to the entrance rather than just taking you back to where you jumped off. After finishing the instance, how does one get back to the entrance to turn in their quests? don't know if that works in general, but doing that once the dungeon is complete makes for the quickest return to the quest giver at the start of the instance. All run in together (to avoid the lightning from the cyclones) to the centre of the bosses hitbox. Form a small circle facing each other to keep the elementals asleep (They wake when not being looked at). Stay in this position for the entire fight. Heroism/Bloodlust/Time Warp/Ancient Hysteria after first move in phase is completed and the cyclones are back out and moving around. Avoid the cyclones when they are moving around, away from the boss, for the entire fight, and healer can heal through anything with ease when they move in to where you will be DPSing, Tanking and Healing from. Tank goes in first to turn it facing out the window, everyone then begins DPS from either side of the boss. Cyclones will spawn everywhere, they move slowly, but when they hit you, you get bounced up in the air and take small amounts of damage. More of a pain for the healer as you get knocked away and sometimes way out of range of the tank. Uses Chilling Breath which can be avoided by staying to the sides. You want Upwind of Altairus on your group at all times. Avoid Downwind of Altairus by moving so the wind is blowing through you, into the boss. Use Heroism/Bloodlust/Time Warp/Ancient Hysteria at any point if needed, but with the Upwind buff, you most likely won't need it. Spread out to avoid Chain Lightning (Has a huge range). Dispel Magic on Static Cling to un-root people. Usually casts this just before his massive attack. When he starts casting a small triangle of lightning on the ground, you need to all run inside the triangle, before he uses Supremacy of the Storm. Anyone outside the triangle will get deep fried in seconds by this ability. Use Heroism/Bloodlust/Time Warp/Ancient Hysteria as soon as everyone is back out of the triangle and spread around, following the first cast of Supremacy of the Storm. No enrage and a very easy "Tank and Spank" boss. Side note: Be on the look out for large Golden Orbs as you travel through the Heroic Instance. Collecting 5 (Usually involves some well timed or risky jumps off the sides of the platforms, or scary maneuvers on boss fights) in one visit to the instance awards Extra Credit Bonus Stage. A funny nod to the many collectable bonus rounds from games of yesteryear. I'm a paladin, and when i get cycloned in here, it REMOVES, my AURA, soo annoying, i just been in the dungeon less then 5mins, and they removed my aura 4 times so far. Idk what mob cyclones tho. Any one else having this problem? Check your aura next time you get cycloned paladins. Kind of reminds me of the ancient Wingly Capital City "Kadessa" from the game "The Legend of Dragoon". It's a lesser known game, albeit, much beaten in popularity by Final Fantasy. Is an image link, sadly I couldn't get an image of it before it was being attacked by the Humans and Dragoons, but you can still see the similarity. Really good game if you haven't played it, Playstation one. Emulate it though, to hard to get a hard copy now. WoWhead says you can catch fish here lol. As I became extremely bored, I thought it'd be a good idea to whip open paint (Yes, PAINT ;D), and produce an actual path of the zone. When first observing the map, I found that the actual root taken was different than what I expected; some lines being stairs, some being ramps, some being walls. Hope this extremely professional image helps. Here is a little trick I tried yesterday. The human mobs near the end can be mind controlled over the edge which can help a lot since those groups can be tough. I did it on normal but I guess it works on HC also. It is probably a mistake from Blizz so I can imagine it will be changed soon. Edit 13-2-11: This still works. Tested it on HC today. I must know the music scripts for this area! I fell in love with this place for it's music and I need the scripts which no website can provide! The teleports are called 'Slipstream'. A Stargate reference? Fun fact: If you have a priest in your group, they can mind control the Tol'vir trash after the second boss. More fun fact: You can run said mind controlled trash mobs off the edge and they die. Don't ask hunters to trap mobs within the electric triangles. It just doesn't work. If a hunter lays trap outside of the triangle it doesn't mean he can't aim, it means he knows and expects tank to pull through the trap. Traps within the electric triangles don't work. If the mobs are static and hunter doesn't respond to "freezing" mark it doesn't mean he's sleeping, it means he will trap after the pull. For everyone trying to find the place for the first time. The Vortex Pinnacle is a set of floating towers that are in the skies above the sea a short distance from the shoreline of Uldum. It is located a touch south and east of the City of the Tol' vir which is on the southern coast of Uldum in the river delta with the lush greenry. If you are looking at the map in Warcraft, you will find The Lost City of the Tol' vir at the mouth of the main river in the delta. And slightly south east of that (looking at the map in Warcraft it would be a touch lower and to the right) is the Vortex Pinnacle floating in the air off the coast. It is almost directly south of the Halls of Origination. The Throne of Winds is to the other floating towers complex. It is to the south of the Ruins of Ammon. It is where a raid is located and not the instance of the Vortex Pinnacle. The entrance to the instance is on a platform near the top of the center tower. For those with rep tabards on, I received 1,748 (Tharazane) reputation for clearing this on Heroic. NOTE: Some of the trash stratagies may be out of order sorry if they are. Pretty much youll start out with some cloud princes and adds that do mediu damage; these do some knockbacks and the adds are casters so nontankable at a location of ur choosing unless u interupt them. Watch out for Lurking Tempests: dont kill them, but when you turn your back they'll fire lightning bolts at you. Also, howling gales, or little orbs that knowck you off the platform if you come too close, need to be dps'd a little to temorarily deactivate their knockback. Take the whirlwind to the next platform. Later you will encounter a large amount of mobs lined up a spiraling staircase. Take one side and stay out of their aoe, and dps down the assasins first (if there are any). When you meet stone drakes they will cast a healing well that is on the ground below them; the tank or ranged group members must pull them out of their well and then dps them down (group members can stand in the well to get healed!). This is a drake boss that can drop a real nice and rare flying mount. Pretty much try to avoid his beth but if you can't its all good and its pretty easily healed through. Stay on the side that gives you a speed increase buff...if not it will be a speed decrease debuff. Thats pretty much it, but in heroic he also summon a bunch of hurricans that will move around constantly and will toss you up if you make contact...just a bit anoying for the healer and casters. Tke the whirlwind to the next platform. Next you'll meat a group of mobs with some nonmana npc's and some with mana. The temple adepts that have mana should be CC'd as they provide HUGE heals at little expensive to their mana, and there are usually 2 per group. When you encounter mobs within a type of electric triangle, the tank must pull one and LoS using the orner that is up the stairs. If the group is in the triangle, all spells cast against them will be redirected, and therefore CC's will be useless; CC the mobs as they make their way upth stairs. You will then encounter Skyfall Stars, or a swirl of arcane type orbs: they are nontankable and do a good amount of damage, so just burn em down quickly with your dps. This boss is pretty much a tank and spank up to the point where he starts casting a grounding field which looks like an electrical triangle, get under it asap. After the triangle forms, he will port up to it and chanel an aoe that will kill you in like 2 seconds if your not under the triangle. Also, during the fight, he will cast a chain bolt that can do serious damage if the group isnt spread out. He also casts a snare type spell ( i think its called static something lol) that you can avoid by jumping before he casts it, but it is dispellable, so its not neccesary to avoid. Even though the drops here and in Stonecore are rare/blue/Superior, they are not as good as Ilvl. 318 quest items you will find in Uldum/Twilight Highlands. In Cata, it seems that the color coding for gear is not about quality as much as it is about whether it came from a quest/instance/raid. Thus, don't hold on to any drops from here if you find a 318 green that is better... the color doesn't mean anything for gear quality anymore. Rogues can sap the add that is near the edge on 2 group of adds that took shielding under the static spell shield. Allowing the whole group to sneak throught. Save u couple minutes and a lot of pain. As a 90 blood DK, ilvl 464, the heroic version of this isn't to different from soloing the regular version at 85. Did it yesterday farming glory cheeves- the golden orbs require getting a bit creative on 'looting' them. (2 are by the first 2 swirling orbs that knock you back, another two are floating above Altairus where you have to utilize his tornadoes to pop you up there, and there's a couple others). Biggest difference is 'Static Cling' on Asaad. Where you need to jump to avoid the "cling" or else you die from the area of effect electrocution. So assumming you kill this guy on heroic, solo, you're gonna get the cheeve. Some of you 90s that never did this in the 80s with a group might be having a little trouble trying to figure out how to get to the next platform like I did. I kept jumping into the vortexes and kept ending up at the beginning. I didnt figure it out until my mouse accidently scrolled over the vortex to see that you have to click it to ride it to the next platform. You have to be lvl 81 to obtain the quests. Male sure, for Altairus, when he changes the wind, go upstream of him! It gives you an awesome buff, whereas going downstream gives you a painful debuff. I am so sick of people in a random dungeon group fighting downstream and not listening to chat.. If you have a stealth ability (Camouflage works too) you can bypass all the trash leading up to Altairus, then jump off to teleport to the entrance, taking at least four minutes to farm. My experience, soloing Heroic Vortex Pinnacle on a Level 90 Ret Paladin in ilvl 526 gear. I took the portal to Dalaran from Shrine and used the Caverns of Time portal in the Violet Citadel to get to Tanaris. I then flew to Uldum on my mount from there. The entrance just to the south-east of Tol'Vir, very high in the sky. After the first bridge and a few times after that, you'll come across a Lurking Tempest. They aren't really worth trying to kill and have some wacky mechanics, they dissapear when you are facing them and then re-appear when you look away and cast at you. Best just to walk past them and continue to face them until you LoS. Young Storm Dragon is nothing to worry about. But make sure that you pull him out of his healing circle, unless you want to spend forever fighting it. Howling Gale Don't bother killing it, they have a hefty bit of health and can just be ran past, as long as you smack them a few times to keep them from knocking you around. Temple Adept Healers in a pack of Tol'Vir. If there is just one, I found I could focus it and down it before it had a chance to heal itself up, but when there are two I recommend you CC one until you kill the other. Grand Vizier Ertan was a piece of cake, I found that I was able to burst him down quick enough for him to be of no problem - 25 second kill time. Altairus was also extremely easy, same thing, just bursted and it died relatively fast. And yes, no mount.Not that I'm here for it, or I wouldn't be running Heroic... -43 second kill time. I will say, this place is a breeze to solo on Heroic, for the most part. I expected far more challenge and was left sort of under-whelmed. Not a friendly instance to grind the mount, like Stonecore which takes about 4 minutes per run. Lots of trash, and most can't be bypassed even at 90 (unless you have stealth, natch). If you have 425+ Archaeology skill you can click on the Magical Brazier located at 62.0, 31.6 in The Vortex Pinnacle. This will start the quest Whispers of the Djinn which allows you to exchange a Tol'vir Hieroglyphic for a zone-wide buff called Whisper of the Djinn which regenerates your health and mana by 1% every 3 seconds while in the dungeon. This buff is applied to all party members and will persist through death. New players joining a dungeon in-progress will also receive the buff if it was activated before they got there. The MapID of The Vortex Pinnacle is 769. This is used for any WoW API function that requires a MapID. Don't get discouraged if it takes a while. This is one of the better looking mounts in the game. Dropped on a normal run after killing Altairus approx 150 times. I say approx because I wasn't running the addon rarity when I started running VP. I raised 2 reps to exalted with tabards in the process. Not sure if intended or bug but farming this with a Shaman is pretty easy. Glyph of Ghostly Speed and you'll race through the instance at 200% speed. To move to the next platform run to the nearest cyclone and click to generate the green "enter vehicle" arrow. Don't step into the cyclone before you see the green arrow or you'll fall and spiral back to the instance entrance. No need to "exit" the cyclone - it drops you. If you get blown off the edge or fall through a cyclone you'll end up at the entrance to the instance as sonicross said. At the entrance to the instance you'll see 2 cyclones. If you stand with your back to the instance swirl, the cyclone to your left will take you to the second platform and the path to the second boss. The cyclone to your right will take you to the third platform and the path to the third boss. If you die and release spirit you'll find your spirit self on one of the lower floating islands above Uldum. Fly up to the center floating island which is also the highest. Re-enter the instance. Take a cyclone if you need to get to the second or third boss. Beautiful dungeon, Blizzard needs to do more like this. The portal entrance is at 76.69, 83.79. It is very high in the air. I had trouble getting over the bridge to the second boss, Alterius. The winds kept knocking me over the side. I targeted the sphere in the center, and hit it with my weapons for awhile. Eventually, it let me through. It does not disappear or seem to lose power, for some reason. 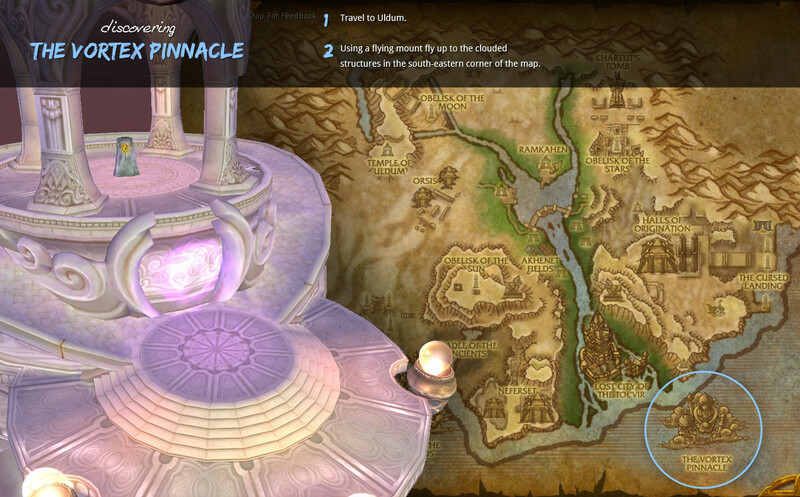 The Vortex Pinnacle is a level 82-84 5-man dungeon located inside the Skywall, the air domain of the Elemental Plane. The entrance can be found in the skies of Uldum. Here Al'Akir's armies of air elementals and commanders below the top of the chain gather their strength. The dungeon's architecture is distinctive as players travel between platforms on zephyrs and fly around when knocked off the walls. These air gusts are useful for completing Extra Credit Bonus Stage, in which players reach golden orbs floating in strange places throughout the instance. This dungeon is popular among players as the second boss drops Reins of the Drake of the North Wind. Players can also complete Whispers of the Djinn with a Tol'vir Hieroglyphic for Whisper of the Djinn: Exposure to this magical smoke heals your wounds and replenishes your mana slowly over time. "The Vortex Pinnacle exists within the elemental plane of Skywall. Its elegant structures, crowned with bronze and gold, sit atop platforms bridged by pure air. Yet behind its exterior beauty, the pinnacle harbors Neferset tol'vir, as well as Al'Akir the Windlord's merciless elemental legions. As long as the barrier between Skywall and Azeroth remains open, terror will rain down on Uldum from the skies. At present, however, it is more than a breathtaking spectacle - it is the staging ground of an army. The lieutenants and servants of Al'Akir, the elemental lord of wind, have allied themselves firmly with Deathwing, and they gather in the pinnacle to lay siege to Azeroth. Their incursion into the ancient, vital land of Uldum will be impossible to repel on the ground, so those who would defend their world must do the nearly impossible, and take wing to invade Skywall before it is too late." Grand Vizier Ertan – Ertan defends the Vortex Pinnacle under the command of her master, Asaad, against any ground-dwellers who dare intrude on the realm. To fulfill her duties, the elemental noble has been granted mastery over the primal forces of lightning and wind. Altairus – The immense storm wyrm Altairus maintains an unyielding vigil over the hovering platforms of the Vortex Pinnacle. The very energies of the storms pulse through this being, and he is said to command the wind currents that buffet the elemental fortress. Asaad, Caliph of Zephyrs – The fearsome elemental Asaad was named guardian of the Vortex Pinnacle by Al'Akir himself. With Siamat, Lord of the South Wind, imprisoned by the Neferset tol'vir, Asaad believes he may ascend to the Conclave of Wind if he performs his duties well.